In response to the Haggerty Museum of Art’s exhibition Agnes Denes: Projects for Public Spaces, students from Milwaukee Public Schools and Marquette University have created large-scale sculptures from discarded materials. The student artists worked cooperatively, each school producing one sculpture. The purpose of the project was for students to learn about and call attention to ecological, cultural, and social issues affecting their communities. 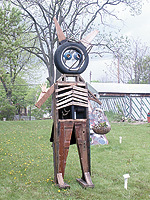 The completed sculptures will be on view outdoors at Greer Oaks Gallery, 2463 N. Palmer St., through June 13. Participating schools andorganizations include Ralph H. Metcalfe School/Fitzsimonds Boys & Girls Club, Riverside University High School, Hartford University School, Mary Ryan Boys & Girls Club, Marquette’s Art Club, and Marquette’s Students for an Environmentally Active Campus. Greer Oaks Gallery opened in 2003. According to artist/owner Calvin Greer, “The gallery was at first going to be a place to just show my work but it evolved into a place to show other artists’ work as well.” Both established and emerging artists have been featured at Greer Oaks, including Evelyn Terry, Della Wells, George McCormick, Mutope Johnson, Patrick Turner, Daryl Harris, Charles Lindsey, David Anderson, Sylvester Sims, and many more. Calvin Greer’s intricately carved and inlaid wood plates, bowls, and drums can also be seen at the gallery. Greer’s home/gallery is itself a piece of art, complete with ceiling murals, stained-glass windows, and beautiful woodwork. During the 1930s and ’40s the house was know as the Casablanca Hotel. Legendary entertainers including Louie Armstrong, Cab Calloway, and Billie Holiday were all guests at the hotel. During the 1970s and 80s the building was used as a rooming house. Calvin Greer bought the house in 1997 and has since restored it to its original splendor. For information about the show, contact Lynne Shumow at 414/288-5915.